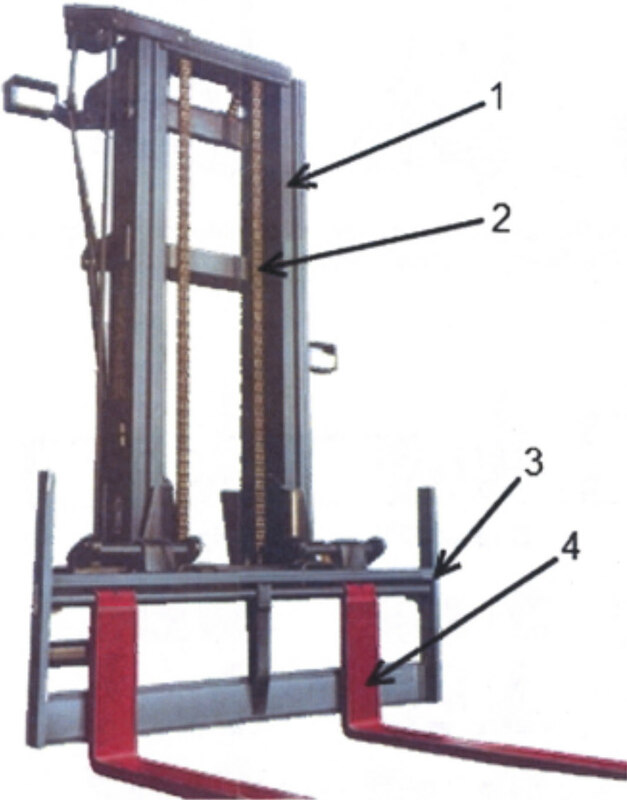 This is the actual mechanical structure that allows the forklift to lift specified loads to specified heights. The upright shares common items, with attachments and other applications making certain uprights function differently for specific jobs. Uprights are also commonly known as masts. Nested Rails/Channels- These allow the upright to extend up to its maximum fork height (MFH) and down to its lowered position or collapsed height. Lift chain and anchors- These are used in combination with the lift cylinders and the upright rails to raise and lower the upright. Carriage- This is the solid steel frame that raises and lowers in the upright. The forks also mount to this along with other attachments. Forks- A solid steel implement that rides on a carriage used for lifting loads. Uprights are designed to allow a vehicle to pass through doorways or trailers with the upright in the collapsed position while still being able to reach loads in warehouse racking. This is accomplished through a series of nested rails and hydraulic lift cylinders and chains to raise the upright in “stages”. How many stages does your mast have? Free Lift is a term used to describe a style of upright/cylinder that allows the carriage to lift separately from the other rails in connection with the Upright. This is normally done with a separate cylinder called the Free Lift Cylinder. Free Lift Cylinder - The lift cylinder normally in the center of the upright that helps to lift the carriage or final stage of the upright. Depending on the manufacture and style there are many different configurations. Here is an example of some of the common ones. Free Lift cylinders also have different styles. Most common configuration would be with or without "Free View". 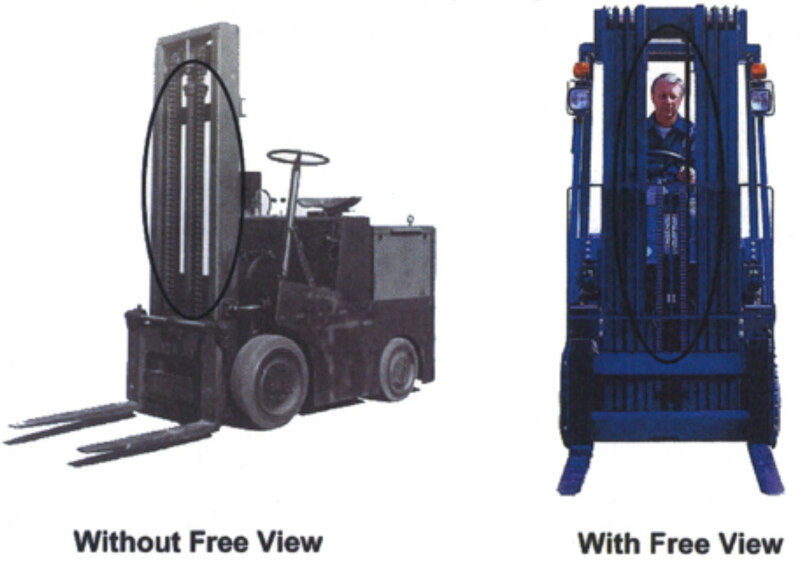 Free View uprights, also known as FV or High Visibility, have a less obstructed view when the driver is facing toward the forks . This allows the driver to handle material more safely. Below is an example of a standard and a "Free View" upright configuration. Where do I find the Mast's Serial #? In order to determine the part numbers for mast parts, we will need specific information about the mast. The capacity of the truck can be found on the data plate along with the truck’s model and serial number. The Mast Number or Mast Serial Number should be stamped on the outside of the driver’s side mast channel. Clark location: The numbers are stamped in approx 5/8"" tall letters. Outer mast channel, driver's side, about half-way up, sort of near the lowest ""bow"" that ties the two sides together. It is on the front face of the channel. Where do I find the Mast's Cylinder #? 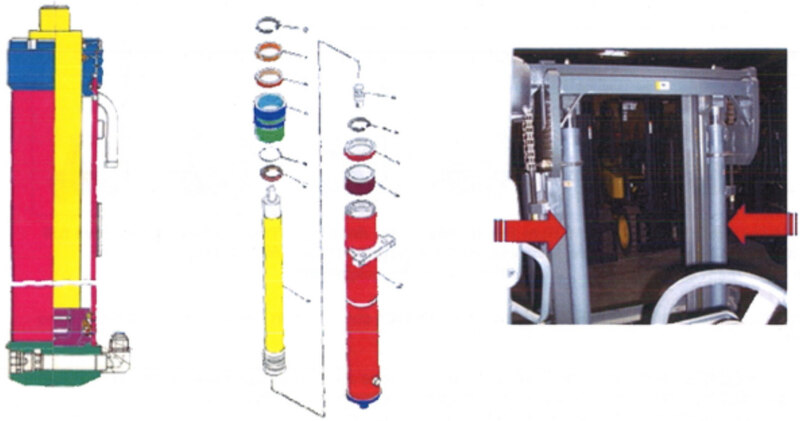 The Hoist or sometimes referred to as Main lift or Secondary Cylinders are normally used on duplex and higher upright configurations . It is very common for duplex uprights to only have Hoist Cylinders. Hoist/Main lift/Secondary cylinders - These are the cylinders that raise the center sections of the upright. There are normally two of these cylinders one on each side of the upright. Here you see the basic make up of a Hoist cylinder. What common parts do you offer for Masts & Hydraulic Systems?